In the vast world of pop music, every now and again there’s that member of the industry that seems to genuinely love what they do, and Olly Murs is undeniably one of those people. One glance of his Instagram shows his trademark Essex grin plastered over his page, and more-so shows that he loves his life and what he’s doing with it, and this is no more reflected than in his feel-good pop music. Despite not actually winning The X Factor, Olly Murs is one of Simon Cowell’s most successful products, one who just about managed to get a foot in the door before the world lost interest in Mr Cowell’s various franchises. 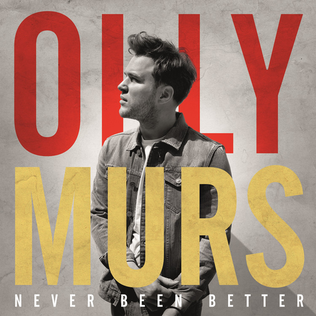 But aside the forgotten faces of past competitors, Olly Murs remains as strong as when his first single was released. I’ve always been a fan of Murs, his jovial, beautifully poppy tracks of sunshine are always as lifting and laced with pep as pop gets, and his latest LP- Never Been Better, is no different. Bouncy piano chords complimented with palpitations of brass make up the joyous Never Been Better, ‘do-do-dos’ and chipper production reminiscent of Will Young provide the backdrop for Murs to popify on Can’t Say No, and the loveable near-cheesy aesthetic of Murs makes an appearance on Why Do I Love You. As much as I’d expected, there’s nothing to really complain about when it comes to Never Been Better, I personally prefer some of Murs’ earlier work such as Busy or Dance With Me Tonight, but his fourth studio is still very likeable. Olly Murs is a consistent example of pop music done right, the lad sticks to what he can do and that’s sing as if he’s got a huge smile on his face- the kind that makes the women melt, and makes men think ‘I actually quite like Olly Murs‘. With writing credits from highbrow stars such as Paul Weller, Ryan Tedder and Mike Posner, as well as guest spots from Demi Lovato and Travie McCoy, Murs is bit-by-bit cementing his place as one of the key male solo stars of pop music.